Can Michael Bloomberg defeat the NRA? 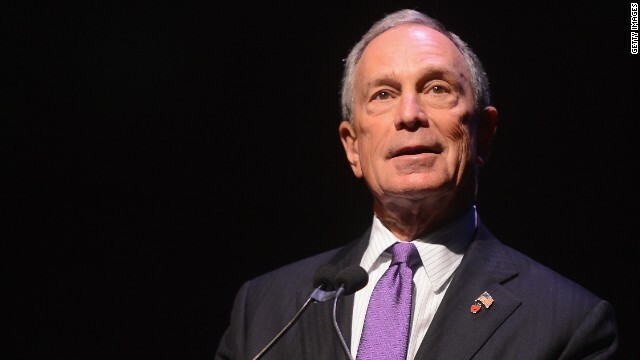 (CNN) - Michael Bloomberg is investing a chunk of his personal fortune to minimize the influence of the National Rifle Association. The former New York City mayor pledged $50 million to his new group Everytown for Gun Safety, an umbrella organization for his two other gun control groups: Mayors Against Illegal Guns and Moms Demand Action for Gun Sense in America. It aims to make the political climate more supportive of gun control. The new organization plans to compete against the NRA by adopting its playbook. The NRA has built an impressive and effective organization that touts millions of members, a robust lobbying organization and a massive campaign arm. "You've got to work at it piece by piece," Bloomberg told the The New York Times. In its grass-roots operation, Everytown plans to increase its membership from 1.5 million to 2.5 million this year to implement its education and mobilization efforts. The group will focus on 15 states that have liberal gun laws, including Texas, Montana and Indiana. States that have advanced gun control initiatives will also receive attention, including Colorado and Washington. "The NRA should be afraid," said Shannon Watts, founder of Moms Demand Action. Women, and more particularly mothers, will be the key demographic in the outreach to curb gun violence. We want you to weigh in: Can Michael Bloomberg and his millions defeat the NRA? It's called "The Second Amendment". We have a policy, dumbass. It's called "The Second Amendment". I'll give up my armed protection when Michael Bloomberg gives his up. Until then, he's just another do as I say not as I do big mouth hypocrite. That's like asking if those who got Prohibition enacted was a win. Even it Bloomberg wins; he loses like Prohibition was repealed. Blooomberg wants to control the nation. What he says is law. Sounds like Germany in the 1930s. Does he want to be FUHRER or just SS-Reichfuhrer? I bought a bushmaster Ar .223 about four years ago, it came with 2 ,30 round Mags and a hard case- $700. Just sold it for $850 at a gun show after 4 years of use – GUN CONTROL IS AWSOME!!!!!!!!!!!!!!!!!! You want to get some rifles off the street!!! – $50 million devided by 10,000 equals 5000. – thats 10,000 gun owners like myself who would be glad to give you our rifles for $5000!!! – COME ON LIBERALS – It will save lives right???????? Why is it the RWNJ's always think it's the liberals that want gun control. 1st off, the very first modern bill was the Brady Bill, signed into law by Ronald Reagan. And he was a GOP conservative, who was mentally impaired. If push came to shove, the RWNJ's will be surprised by how many other people not only have weapons, but also know how to use them. Sometime to think about the next time you want a shooting war here at home. What you are failing to mention is that this law was voted in for a very different reason. The democrats, which you are obviously one, want to make some political hay with the sad events that have taken place. The real issue is that what they propose does nothing or they want to be exempt. George – get REAL! I'm a gun owner, an independent and feel we have FAR too many guns out there. Those FOR gun control are mostly NOT FOR repeal of the 2nd Amendment – at least those I know are not. The problem is that we (collectively) have this inherent fear of big Govt, which magically evaporates when one Party (or the other) gives it's voting block what they want. And ad nauseum, the other side rails against it... in this case it's NO gun control. In another, it's 50+ attempts to repeal their own healthcare law and another.. immigration. Too may sheeple..
You guys are idiots, Im 23 years old, not a republican or NRA member, Im want gun control becasue i have GUNS FOR SALE STUPID!!! – You liberals are the best thing for my bottome line i could have asked for!! – So Screw you and your dead kids!! – give me another Newtown Massacre, Theres a nice watch i got my eye on!!! – and before you express your moral high ground on me- Ive never been called empathetic, and prefer it that way!! Not if I can help it. I'm an NRA life member and I'm sending the NRA an extra $100.00 to fight the contemptible Bloomberg. If even half of the NRA membership matches my donation, we'll have a bigger warchest than Bloomberg. And he can forget about ever running for POTUS, after this debacle. My favorite part of the article is the insistance that the "emotion" that will "win the day" is Mothers' fear of losing their children. How in the world will we defend this country if overprotective, fearful women rule the day? When emotions rule over logic, you know dimworld is in power. M. Bloomberg will either run out of money, tire of his zealotry against guns, soft drinks and junk food, or his heirs will go to court, have him declare incompetent, become trustees of all of his accounts, and Michael Bloomberg will assume his rightful place as a foot note in the history books. Defeating the NRA.? Not in either your or my lifetime. When resources are roughly equivalent, victory goes to the most fanatical. And that is pretty clearly the gun worshipers. Bloomberg will defeat the NRA, with the help of all the families of those whose lives have been cut short by gun violence. I own and like my guns, but the NRA does not represent me. I think he would have a chance if he started an organization for responsible gun owners to join and belong to called "The Well Regulated Militia." There is only one way to defeat the NRA. It has to be super rich Republicans willing to dump a ton of money to crush the NRA with negative adds and propaganda. The gun toting folks out there aren't going to listen to any liberal but if the anti-NRA song were being sung by Republicans, then they might listen. Fat chance. The NRA already owns the GOP, so Bloomberg has no chance. You really think a gun toting bubba is going to listen to a New York liberal? If the only thing the 50M goes towards is making sure people that have mental health issues don't obtain guns, this would get my support. That should include all liberals because we all know they are a bunch of head cases. I think they are anti-gun because they don't even trust themselves... 🙂 On a serious note thought. We need to prevent people with mental issues from obtaining guns. I do not support taking away the choice of gun or limits or government control of law abiding citizens. And countries that have cars will have accidents, countries that have knives will have stabbing, countries that have poverty will have robberies. So under your genius (if the rest of us are all so stupid) we should just take away anything that is dangerous? And don't try the cars, knives, etc...have other uses because guns also have many uses not just one. I think you should read more and comment less. Your comment supports a conclusion counter to your own. If you own a gun be careful, you may shoot yourself. Why don't you go enjoy the afternoon with some sheep. Not only is your post devoid of fact, you can't even form a coherent sentence. Lets split this country in half and be done with it. No violence, just have each state decide. I bet that sounded better in your head after you posted this. You must be a liberal because liberals and anti-gunners have yet to come up with any solutions other than gun control. Look at all the shootings in the last few years and its the same cry every single time..GUN CONTROL! Many of these shootings could have been prevented if the government would think outside the box....which they do not. They see the gun and NOT THE PERSON PULLING THE DAMN TRIGGER. Who needs that 50 million to go to things like our wounded vets or feeding the hungry or sheltering the homeless when he can spend it on yet another useless attempt to strip our rights piece by piece. If I didn't know better I would think he has some stock in gun manufacturers cause every time he opens his mouth he sells more guns then the NRA could ever dream of. If you don't like American Rights (Bill of Rights) just move out of the country already. Why is that the one's that are difficult to penalize and hold accountable are the one's illegaly possessing firearms, why is it that I have never had to arrest a law abiding citizen breaking the law with a legal firearm, I've arrested many criminals with illegal firearms. How is it that the statutes currently in-place when broken by the guilty are not enforced to it's full measure. Our penal & justice system is a revovling door managed by self serving individuals who have lost their sense of accountability for the guilty. IMHO: Our countries political leadership have lost it's reasonable thought process to manage and mitigate justice with clear balanced moral-character. Professional politicains identify emotional issue's and use them as platforms of adventage to further position themselves. In a society where everything goes…We have lost our moral place. Not surprising we have children killing each other in schools & extremely mentally ill individuals running loose on our streets without any assistance or treatment. We reap what we sew. Ban gangs, not guns! Gangs are doing all the gunb violence in the US.! He will not succeed. He may have almost limitless resources, but the gun manufacturers, through their NRA lobbyists, have more. The NRA has helped start an arms race between the police and the public. Like ginning-up a war with the intent of selling guns to both sides. Guess what. Obama still has no intention of taking away you guns. Despite what the NRA fear mongers tell you. I think you are a little confused by the funds gun manufacturers donate to the NRA, or frankly what the NRA really is for that matter. The NRA gets the bulk of its funding from membership dues, followed by additional member donations. One of the biggest "contributors" is MidWay USA (a gun supply/accessory type merchant) – and a large chunk of that comes from its patrons being offered the opportunity to round up to the nearest dollar (or more) and make a donation during checkout. Don't blindly buy in to the storyline. Been a law enforcement officer for nearly 18 years; the anti gun cause is as political as one can imagine. Bloomberg has made it clear for many years in words and action what his intent is regarding prohibiting and or restricting gun ownership and use. The simple fact is this, the only one's penalized for whatever statute is created relating to restricting firearms ownership will always be the law abiding citiizen. Won't work. People defending their rights will be more determined than those trying to take them away. So true. I have been hearing many conversations at the airports among people talking that are ready to rise up and start a civil war. They are tired of government and the corruption that exists within it to get the right things done. Pretty scary if you ask me. I'm starting to hear more a more people talking about this. The sad thing is the anti-gun and liberal groups will be left with nothing to defend themselves because of their stance. Hope that day never comes and we need to solve these problem by kicking out the elected officials and start over with people who are in the middle. The extreme people on both sides need to sit out the next few elections to get these problems solved. Sit out means they decided not to vote, not take away their vote. Mr. Bloomberg will be found hiding in a dirt hole like Saddam Hussein. This is just pushing us more and more towards a revolution. I am not advocating this just observing. These anti constitution advocates are going to get a lot of people killed. It almost started at Bundy Ranch. This is totally irresponsible of Bloomberg and others to put Americans in this position. He needs to use his money to feed the poor or create jobs. He is demonstrating that he is not responsible with his money and maybe a vast portion of his wealth should be taken away and used to pay for social programs. Why are his actions at this point not viewed as inciting an insurrection? Agreed, I've never seen this country so divided. If they keep pushing to take peoples rights away, this country could go through another Revolution. Is the GOP paying Bloomberg to do this? They should. Few things could tube Dems chances more in Nov than pushing this loser to the forefront. PLEASE make this an issue in Nov. It wouldn't even matter if Mr. Bloomberg sold every asset he had and poured in every last cent. People fail to realize that the NRA is not some large, tyrannical organization that wields large amounts of some mysterious power. The reason that the NRA is successful is because it's not really the NRA that's winning these political battles... It's the millions of Americans who care about their right to bear arms, and don't want to see it infringed on. It's because we each spend hours on the phone calling our senators and representatives, letting them know how we feel about our rights being infringed upon...It's because we give generously to the NRA-ILA which makes sure that our sincere beliefs are heard in Washington, DC and state legislatures around the country. You can try to erode the 2nd amendment and "Defeat" the NRA all you want, but in the end you aren't defeating the NRA, you are defeating american citizens who value the right to own guns, and at the same time desecrating the sacrifice millions of american soldiers made for our rights and died defending. Have you ever noticed that when a US politician sets out to 'win the hearts and minds' of others, that a lot of innocent people end up dead? Now, we have one talking about 'battles' for the hearts and minds of others. Of course he can, because he will not be alone. The NRA has become a reactionary force that denies all attempts to reason or work for the common good. This David will defeat Goliath. @arik – You are so right. Liberals are just like 5th Avenue in NYC..... One Way. Sorry Maria, in order to claim any sort of victory over the NRA and its several million-strong membership, Bloomberg and his fanatical followers will first need to actually, you know, become EDUCATED regarding the issue of gun control and gun "safety". The fact that people like Bloomberg and Feinstein constantly trumpet their narrow-minded opinions regarding the evils of "scary military-style assault weapons" clearly demonstrates their hilarious incompetence on the issue. These semi-auto rifles are used in less than 2% of all gun crimes, while handguns wielded by thugs and drug dealers in "gun free" zones like Chicago make up the staggering majority of gun crime. But why try to ACTUALLY reduce crime when you can attack the actual law-abiding gun owners of the NRA and attempt to demonize them as backwards, uneducated Limbaugh lovers? Problem is, some of us actually know what we're talking about and can see right through your hypocritical liberal agenda, and I promise you that I will not relinquish .0001% of my Constitutional rights just so you can pat yourself on the back and try to convince the rest of America that you've made us all safer. Bloomberg and those like him care about one thing and one thing only...themselves. @emskadittle – You are correct, they care about the power of the people! Lincoln would be a left leaning democrat today. Republicans helping the poor, sick, and old is plain out laughable. Didn't you read the Ryan Budget? You voted for Palin didn't you. Lincoln would be a left leaning democrat today. Republicans helping the old, sick, and poor? Bwahahahah Didn't you read the Ryan Budget? He'll put all the money is some tax free foundation and get a nice write off. $50 million is pocket change to Bloomberg. His heart is obviously not in this. The irony is that the NRA is not their enemy. The criminals, and I include Bloomberg among them, are their enemies. Bloomberg is a Neo-Nazi bent on creating a class of peasants and slaves to do his bidding. He is an evil man intent on destroying freedoms and taking away rights. Gun laws only punish good people, never the bad guy. The NRA is a friend of freedom, protecting our rights, and purveyors of the real common sense. Bloomberg is evil, evil, evil. Can I try some of those drugs you're on? He's actually right. Bloomberg is into controlling the lives of people down to the little details. Look at the laws he passed and some others he wanted in NYC. If you haven't lived in NYC when he was in charge, you don't really understand. Talk and listen to New Yorkers and you will see what I mean. I won't say he is an evil guy, but he does have an elitist mentality and is surrounded by armed body guards all the time. I think Bloomberg's point is about mental people. That makes sense to me, but if try's to go outside of that box, then he loses my support. Sniffing the oxycodone pickled brain flatulence of Limbaugh, and listening to Blaze TV, will not inform you. If you pull your head out of your backside, you won't get all that manure in your ears. "Can Michael Bloomberg defeat the NRA?" No. He can't even keep mayors from dropping out of MAIG (Mayors Against Illegal Guns) because they're reluctant to participate in Bloomberg's covert conspiracy against -legal- guns. Baaahh, just like a Limbaugh/Fox sheepish ditto head. You have an alternate theory why a lot of them don't stick with Bloomberg? That was exactly what a mayor from a neighboring city cited.